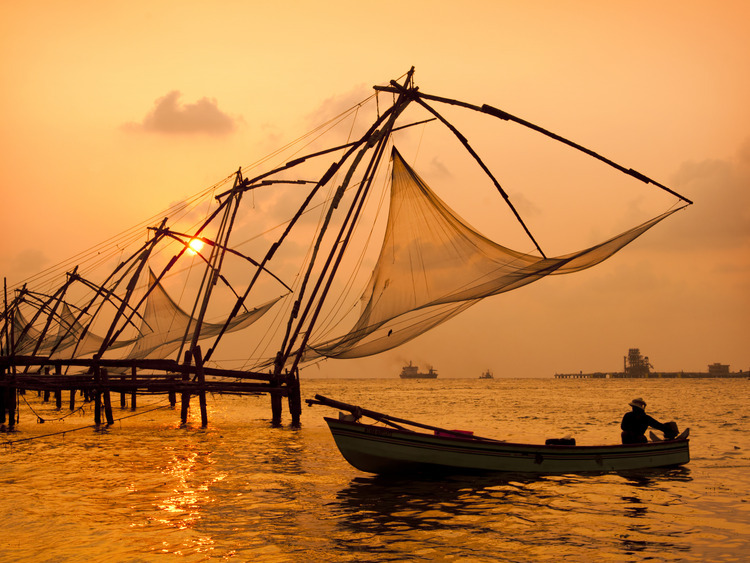 A wonderful opportunity to visit the magical Cochin, this fishing city that attracts visitors with its small islands, the different art centers and architecture with the nuances of European and Chinese origin. Our visit to Kochi begins in the district where the first settlers were Portuguese: Fort Kochi, home to various vestiges of the colonial era such as St. Francis Church, the oldest European church in India, built by the Portuguese. We then visit many more fascinating attractions, including the Chinese fishing nets, a powerful symbol of the centuries-old Chinese influence on this coast and the famous local fish market where locals eat freshly caught fish that has just been cooked. We then go on to visit Santa Cruz Basilica whose foundations were laid in 1505, again by the Portuguese. Arriving at the Mattancherry district we can admire the Dutch Palace, built by the Portuguese in 1555 and renovated by the Dutch in 1663. The building is renowned for the frescoes featuring scenes from the Ramayana and the Puranas legends linked to Hindu gods. Another community that has left its mark on this city is the Jewish community, which has a street named in its honour. Here we admire the typical houses and the shops of various kinds, from grocers to antiques shops. At the end of the street is the Synagogue, the oldest in the entire Commonwealth. It was built in 1568 and is famous for its hand-painted blue Cantonese majolica tiles. In case of events or religious celebrations the visit of church or monuments will be done only by outside. If closed, the Dutch Palace will be replaced by the Indo Portuguese Museum in Fort Cochin.